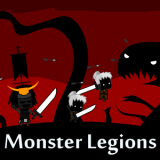 Monster Legions is a strategy game in which you have to lead your army and defeat your opponents. You can recruit new units by drawing cards every 15 seconds. Some special cards will also be available which will have more power. After killing enemies you will get coins and points which will be used to respawn your killed units or to upgrade them. Buy new cards to increase the number of units available.